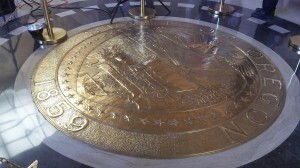 The Oregon seal under the Capitol rotunda. 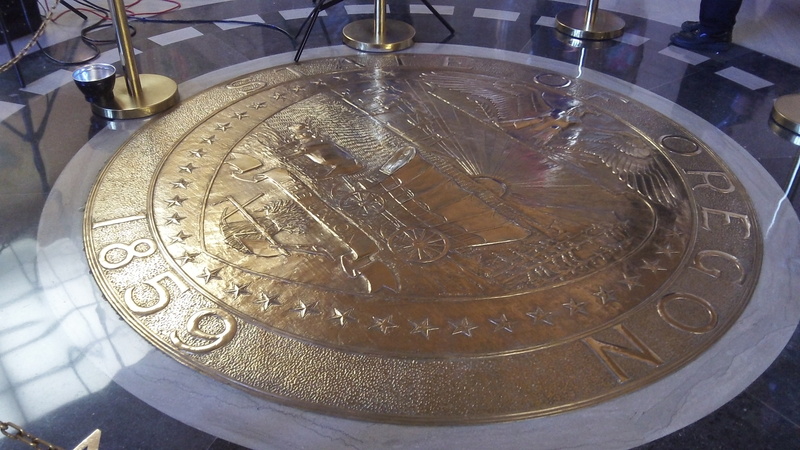 The Oregon legislature will convene on Feb. 3 and stay in Salem for a month whether anybody wants it to or not. So what can we expect? If you believe the “agendas” posted by the Democrats who rule the House and Senate, nothing but good things. In the House, for example, the members in the majority promise they’ll use the short session to deliver “better results for our students, put Oregonians back to work and make government more efficient, effective and transparent.” Can’t beat that! They will, they say, focus on “three key areas: prioritizing access to high quality education, creating jobs and … making government work better for Oregonians.” If you think this means the Democrats will vote to abort the Cover Oregon website, don’t count on it. Will they legislate an accounting of how much public money has been wasted on Oregon’s approach to Obamacare? Dream on. And as for promoting access to “high-quality education,” you can bet they won’t actually do so by making it easier to launch charter schools and expand school choice. What they mean instead is to pour more money into the system we have. Democrats are in charge of the Senate as well. There, the majority also says it will focus on “key areas.” They include “accelerating job growth” and “protecting investment in our schools.” How this investment can be protected they don’t say, but presumably they mean they won’t push for anything that’s different from what we have. They do that in Europe. 1) Prioritizing access to high quality education – No specifics (as per the usual). They could just put a handicap ramp somewhere on the OSU campus and call that “better access”. How’s this for a thought: regulate what college’s can charge for tuition based on a STUDENT’S ability to pay, not their parents. I hear it from friends all the time that they can’t afford to go to school because on paper their parents make too much money… yet their parents either have no relationship with them, no actual liquid assets, or no interest in helping their child out. Why does a student have to wait until 25 to be considered free of the burden on their parents financial chooses as it relates to college?! 2) Creating jobs – How? Let’s look locally: Albany is in the process of creating rules to PREVENT more job-creation businesses from coming to town. All while more and more businesses are closing up shop and leaving Albany (we’ll miss you Ray’s!). I remember seeing “HAVE YOU SEEN OUR HURTING COMMUNITY?” signs everywhere. Apparently our “city leaders” did not. Further more, how will the state body “create jobs”? More government jobs? No thanks, we have enough. Is the state going to start out-sourcing? Tax dollars going to more corporations? No thanks, corporations own enough of our politicians, we don’t need them owning our government services as well. Yet again, no measurable specifics. 3) Make government work better for Oregonians – This one is actually pretty easy to accomplish. Just make government work for Oregonians, period. Mission accomplished.